Freshwater turtles are in catastrophic decline, according to a new analysis by Conservation International (CI). The group says more than a third of the estimated 280 species around the world are now threatened with extinction. The unsustainable collection of turtles for food and to supply a lucrative pet trade are the key drivers behind the fall in numbers. Habitat loss as a result of river-damming for hydro-electricity is another major concern. Dr Peter Paul van Dijk, the director of Conservation International's Tortoise and Freshwater Turtle Conservation Programme, said the outlook was bleak. "These are animals that take 15-20 years to reach maturity and then live for another 30-40 years, putting a clutch of eggs in the ground every year. They play the odds, hoping that in that 50-year lifetime, some of their hatchlings will somehow evade predators and go on to breed themselves. "But if you take these animals out before they've reached 15 and can reproduce, it all ends there," he told BBC News. Unlike their ocean counterparts, freshwater turtles are adapted to live far up river systems, even into small foothill streams. They populate lakes, rivers, estuaries; there are also some species that will tolerate saltmarshes and mangroves. But the 11 families that comprise this collection of shelled creatures have seen their numbers fall relentlessly over the past two decades. The turtles are highly prized across Asia, particularly in China, where their consumption is perceived to have medicinal benefits. The market is so large it is now also being supplied by farms. On top of this exploitation, some of their river habitats are being degraded. "They need to have natural flow patterns in rivers otherwise their nests on the sandbank high up get flooded at the wrong time of year," explained Dr van Dijk. "They need clear water so they can see what they're eating. They need underwater plants which can only grow if the water isn't too turbid. So, to some extent they can be seen as a proxy for the health of river systems." The species in deepest trouble is probably the red river giant softshell turtle (Rafetus swinhoei). There are only four individuals remaining alive in the world. Efforts to get two long-term captive animals in China to breed have not met with success. 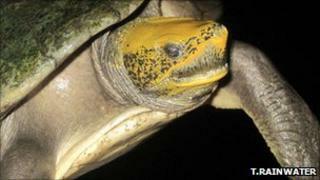 Two batagur species - the red-crowned river turtle and the Myanmar river turtle - have been hit particularly hard by collectors. The red-crowned species was once widespread throughout the great rivers of northern India, Bangladesh and Nepal, but it has now been reduced to a single viable population in the "unholy" Chambal River of central India. The Myanmar species was actually thought to be extinct for much of the last century. Once abundant in the Irrawaddy river system of Myanmar (Burma), its populations have dwindled to under a dozen mature animals in the upper Chindwin river. Egg collection, hunting and habitat loss as a result of dams and gold mining are blamed. A captive population is being built up for re-introduction programme. "All the tonnage of turtle that people want to consume can be satisfied by farming," Dr van Dijk said. "If we can eliminate the unsustainable collection from the wild, we have 80% of the battle won. Beyond that, it's a matter of habitat management for minimal impact on turtles and all the other wildlife in those habitats."